As violence and chaos spreads in Iraq, the public is wary of U.S. involvement in the country. A 55% majority says the United States does not have a responsibility to do something about the violence in Iraq; 39% do see a responsibility to act. Overall public awareness of the situation in Iraq is high: 45% say they have heard a lot about the violence in Iraq and takeover of large parts of the country by the Islamic State in Iraq and Syria (ISIS). However, more Americans (57%) say they have heard a lot about the recent influx of unaccompanied minors across the U.S.-Mexican border illegally. Those who have heard a lot about violence in Iraq are more likely than those who have heard little or nothing to see a U.S. responsibility to act. Still, just 44% of those who have heard a lot about the situation say the U.S. has a responsibility to do something about the violence in Iraq, compared with 35% who have heard less about this situation. Majorities of Democrats (61%) and independents (56%) believe the United States does not have a responsibility to do something about the violence in Iraq. Republicans are divided: 48% believe the U.S. has a responsibility to take action while 45% do not. 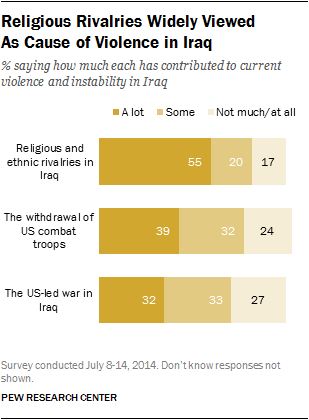 The latest national survey by the Pew Research Center, conducted July 8-14 among 1,805 adults, finds that a majority of the public (55%) thinks that religious and ethnic rivalries in Iraq have contributed a lot to the current violence and instability in the country. About four-in-ten (39%) think the withdrawal of U.S. combat troops has been a major contributing factor, while somewhat fewer (32%) say the U.S.-led war in Iraq has contributed a lot to the country’s violence and instability. 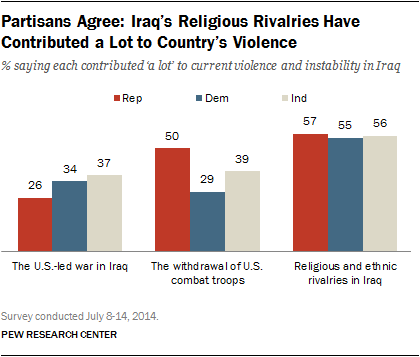 Nearly identical percentages of Republicans (57%), Democrats (55%) and independents (56%) say that Iraq’s internal rivalries have had a lot to do with the rising violence. Republicans are more likely than Democrats to attribute current violence in Iraq to the withdrawal of U.S. combat troops from the country. Half of Republicans say the U.S. troop withdrawal contributed a lot to the current situation, compared with 39% of independents and just 29% of Democrats. While only about four-in-ten Americans (39%) think the U.S. has a responsibility to act in Iraq, that is higher than the percentages saying the U.S. had an obligation to do something about fighting in Syria in December 2012 (27%) or fighting in Libya in March 2011 (also 27%), before the U.S. and its allies launched air strikes in an effort to force Muammar Qaddafi from power. The current survey finds that majorities across most demographic groups think the United States does not have a responsibility to act in Iraq. There are age differences in these opinions, however. People under 30, who are least likely to have heard about the violence in Iraq, are more divided over whether the U.S. does (45%) or does not (53%) have a responsibility to do something about the violence there. Among those 65 and older, twice as many (60%) say the U.S. has no obligation to act as say it does (29%). Among Republicans and Republican leaners, those who agree with the Tea Party (54%) are more likely than those who do not (42%) to say the United States has a responsibility to do something about violence in Iraq. The public is divided about whether Islam is more likely than other religions to encourage violence among its believers: 44% say it is no more likely and 43% say it is more likely. This is a modest change from February, when 50% said Islam was no more likely to encourage violence than others and 38% said it was more likely. Since 2003, opinions on the question roughly have been split. Republicans continue to be more likely than Democrats to say Islam encourages violence among its believers, and the partisan gap has grown over time. Currently, 60% of Republicans say Islam is more likely than other religions to encourage violence, compared with 39% of independents and 35% of Democrats. Among Republicans and those who lean Republican, nearly three-quarters of Tea Party supporters (72%) say Islam is more likely to encourage violence, and 22% say it is not more likely. 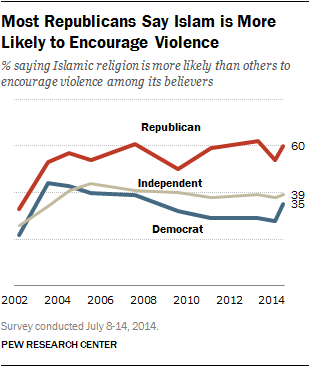 By comparison, 48% of non-Tea Party Republicans say Islam encourages violence, while 40% do not. Young people continue to reject the idea that Islam is more likely than other religions to encourage violence. By 66% to 27%, those younger than 30 say Islam does not encourage violence more than other religions. By nearly two-to-one, adults 65 and older take the opposite stance (52% say Islam is more likely to encourage violence, 28% say it is not). About half of college graduates (51%) and those with some college experience (48%) say Islam does not encourage violence more than other religions, compared with 36% of those who have no more than a high school education. White non-Hispanic evangelicals think that Islam is more likely to encourage violence among its believers than other religions (64%-27%). White mainline Protestants and Catholics are divided, while those unaffiliated with a religion generally believe that Islam is no more likely to encourage violence (59%-30%). For the public’s views of Muslims and other religious groups see “How Americans Feel about Religious Groups,” July 16, 2014. U.S. government officials, including Attorney General Eric Holder, have warned that recent events in Iraq and Syria may increase the risk of terrorism in the United States. However, the public’s worries about an imminent terrorist attack are no higher than they were a year ago, shortly after the bombings at the Boston Marathon. Currently, about one-in-four (24%) are very worried that there will soon be another terrorist attack in the U.S. An additional 35% say they are somewhat worried, and four-in-ten (40%) are “not too” or “not at all” worried. Republicans today are about twice as likely as Democrats to say they are very worried about an imminent attack (33% vs. 17%). By contrast, about half of Democrats (52%) and one-quarter of Republicans (25%) are not too worried or not at all worried. 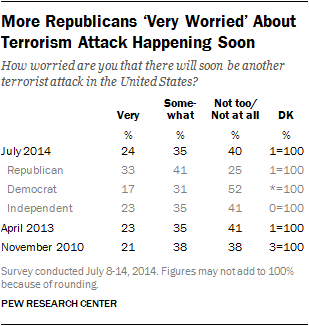 After last April’s Boston bombings, 23% of the public were very worried, although the partisan balance was about even. The public is about evenly divided about the capabilities of terrorists to launch a major attack on the U.S. today. About one-third (34%) say the ability of terrorists is greater today than it was at the time of the 9/11 attacks, while 30% say it is less and 34% say it is the same. That is little changed from last November. Partisans also give opposing views on this question. Republicans are twice as likely as Democrats to say the ability of terrorists to launch an attack on the U.S. is greater than it was at the time of the 9/11 attacks (48% vs. 24%).